Marilyn SanClemente January 11, 2017 January 11, 2017 All Occasion Card, All Occasion cards, CASE, Global Design Team, handmade card, Handmade cards, Occasions catalog, Stamper's Club, Stampin' Up! If you have been following the crafting world, you may have heard the word CASE. So what is a CASE? CASE stands for Copy and Share Everything. A great compliment to fellow card designers since that means that someone really likes your card or project. So I am going to show you how I CASED a card that one of my friend’s made this weekend at a stamping event. Well today my card is inspired by two things – a card that my fellow Stamping Up! BFF Angela made this weekend using the Dragonfly Dreams Stamp set and second, this week’s color challenge from the Global Design Team! And here is Angela’s card. The card base is Whisper White cut to 8 1/2″ x 5 1/2″ and scored at 4 1/4″. The next layer is a piece of Delightful Dijon cardstock cut to 5 1/4″ x 4″. Then the 3rd layer is a second piece of Whisper White cardstock cut to 3 3/4″ x 5″. 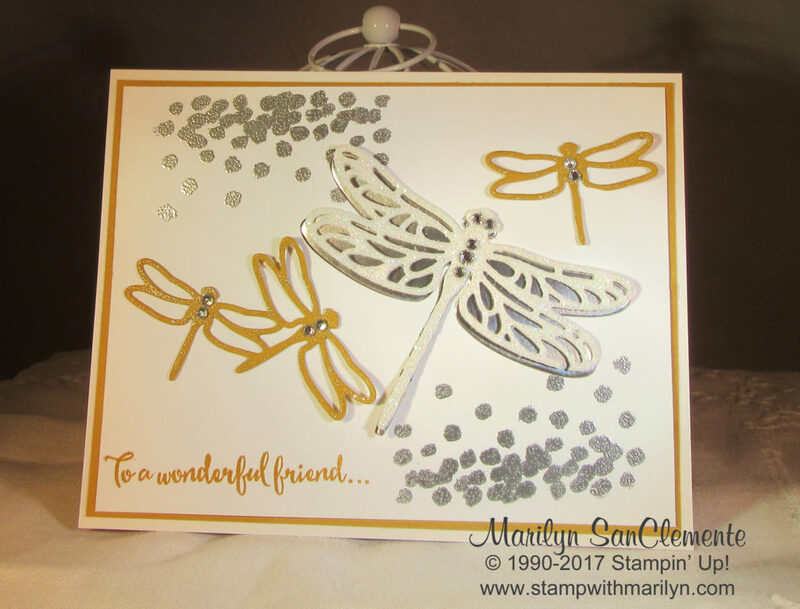 On the top layer of Whisper White, I stamped the polka dot background stamp from the Dragonfly Dreams stamp set with Silver ink and embossed it with Silver embossing powder. 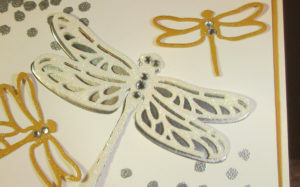 Next I used the coordinating Detailed Dragonfly framelits and cut the large dragonfly from the center of the card. 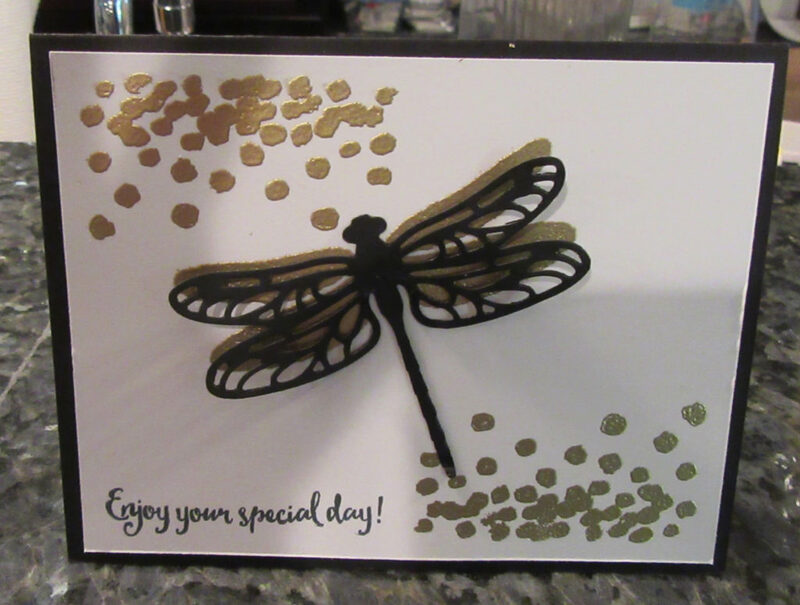 I inserted a Dragonfly that I cut with t he same framelit with Silver Foil cardstock. NOTE: I used glue dots on the center of the body so the wings are loose and you can bend them to give the card a little dimension. Next I cut a detailed dragonfly from a piece of Dazzling Details Glimmer Paper which I layered over the Silver Foil Dragonfly. Then I cut a string of the little dragonflies from a scrap of a Delightful Dijon cardstock. I cut apart a string of two dragonflies and a single dragonfly. I colored the dragonflies with the Clear Wink of Stella Pen to add a little glitter to the dragonflies. Then – don’t forget to stamp your sentiment to the card. I used Delightful Dijon ink to stamp the sentiment. And of course, I used a bling with Rhinestone jewels on the bodies of the dragonflies. Love these dragonflies for this week’s challenge. 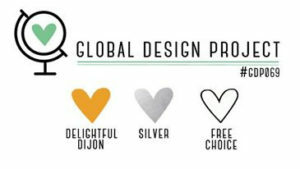 Thanks for playing along with us at Global Design Project.